Traditional security won’t reveal low and slow lateral movement of advanced persistent threats across systems. The open-door access from mobile, shadow IT and increasingly sophisticated scams enables attackers to con unknowing authorized users to reveal enterprise credentials. Even highly sophisticated Security Information and Event Management (SIEM) solutions need simple and speedy scalability to clearly see beyond traditional log and event files to uncover attacker burrows. Too many events. Too many false alarms. Too many systems to track threats from root to damage. And not enough expertise to manage all this data and keep your team ahead of the enemy. If this is too familiar, you’ve woken up to the reality that analysts need an assist from artificial intelligence (AI). AI and machine learning make it easier and faster to find the root cause and chain of events comprising advanced persistent threats and insidious insider activity. Let’s say your team is able to spot advanced threats, and they’ve mastered forensics to see all the places threats are stealing data. You still haven’t stopped the threat. There are just too many security systems to rely on manual processes for a rapid response across detection, identification and eradication. Finding threats is only effective if you can fight back without slowing down business. If a user is suspected of malicious activity or their credentials are compromised, you must react quickly. See how user behavior analytics (UBA) identifies activity anomalies within a comprehensive security analytics platform, while identity governance and intelligence (IGI) automatically suspends the account exhibiting the shady behavior. A report is then generated in an incident response (IR) platform for additional follow-up. 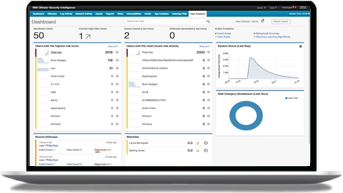 This integration provides automated, user-centric threat detection and mitigation from one window. Advanced threat insights and action to hang on the wall and share to build stakeholder buy-in. Dive a little deeper into the advanced threats facing enterprises today, and learn the key steps to thwart them. IBM solutions help you detect and stop advanced threats.